Football (soccer) is undoubtedly the most popular and prestigious sporting game in the world. It is globally governed by the Fédération Internationale de Football Association (FIFA), the sport’s international administrative body. 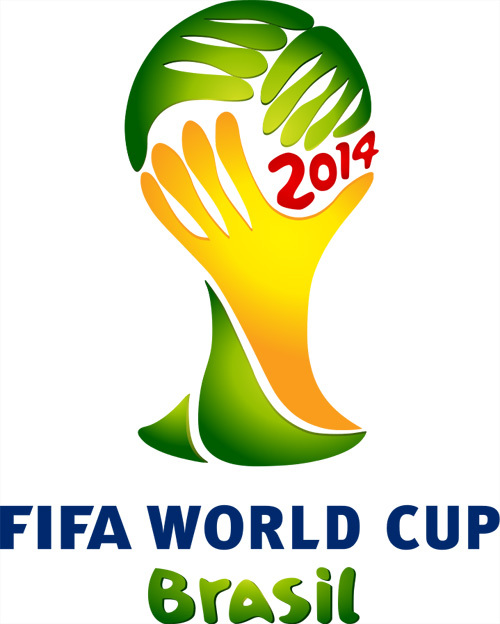 The FIFA World Cup, usually referred to simply as the World Cup is a competition hosted every four years, contested by the senior men’s national teams of qualified countries. This year’s tournament hosted in Brazil is currently ongoing. While reading Hacker News, I stumbled upon an API for the World Cup that scrapes current match results and outputs match data as JSON. The current match if a match is happening, otherwise nothing. I love football and I know a lot of us do too. Due to my busy schedule, I always find myself asking friends about the match schedule. To eliminate this barrier, I decided to build a Match Fixtures widget for WordPress that displays a list of matches to be played today and tomorrow, powered by the World Cup API. If you want to jump ahead of the tutorial below, you can view a a demo of the Fifa fixtures widget here and download the widget plugin files here. The Fixture widget to be developed at the end of this tutorial will be a tabbed widget; the first tab displays matches for today and the second tab displays matches for the next day. Let’s get started with widget plugin development. First, we need to include the plugin header. Without the header, WordPress won’t recognize the widget plugin. Building Widgets in WordPress is easy and straightforward. Extend the standard WP_Widget class and include the required widget class methods, and finally register the widget. The class method matches_today(), shown below, queries the World Cup API, retrieves the matches to be played today and displays it together with the time of play. If no match is scheduled for that day, a No match for today message is shown. The back-end widget settings form is created using the form() method. The fixture widget will consist of a form field that will contain the title of the widget. When data are entered into the form widget fields, they need to be saved to the database for reuse. The update() method sanitizes and saves the data to the database. Next is the widget() method that displays the match fixtures at the front-end of WordPress. 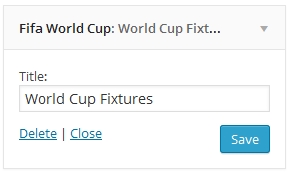 Our fixture widget class Fifa_WC_Fixtures need to be registered using the widgets_init hook for it to be recognizable by WordPress. We still need to include jQuery and the QuickFlip library to get the tab and flipping effect in the widget working and also the widget CSS. View a demo of the Fifa fixtures widget. 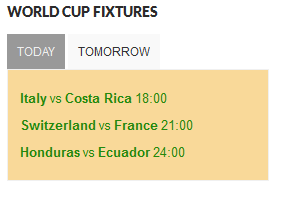 We are done coding the World Cup Fixtures widget. To further understand how the widget was built and how to implement it on your WordPress site, download the widget plugin, which includes the jQuery, Quickflip, and stylesheet files. I hope this helps some of you in learning how to build WordPress widgets and in enjoying this year’s World Cup. Let me know your thoughts in the comments.